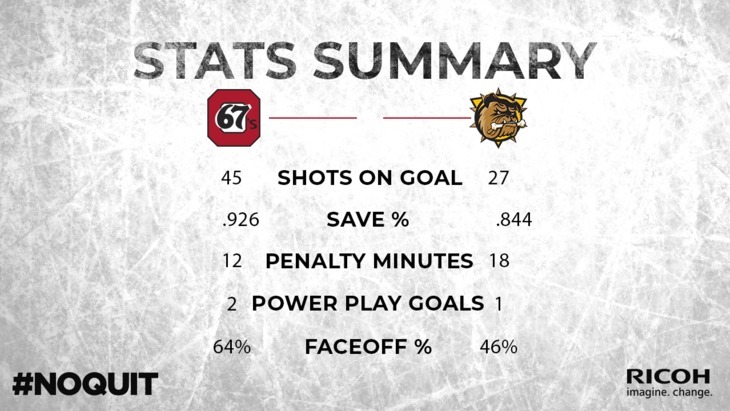 The Ottawa 67’s took the broom to the Bulldogs on Wednesday night, beating Hamilton 7-2 in Game 4 to claim the series in as many games and advance to the Eastern Conference Semi-Finals. 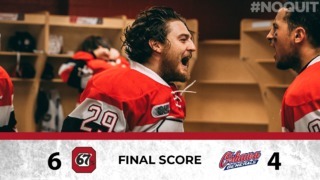 The win gives the Barber Poles their first playoff series win since 2012 and is also the first OHL playoff series win for 67’s Head Coach and VP of Hockey Operations Andre Tourigny. 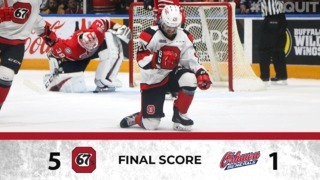 Seven different 67’s scored in the lopsided victory on Wednesday, while Merrick Rippon, with the winner (1G, 1A), Lucas Chiodo (1G, 1A), Marco Rossi (1G, 1A) and Sasha Chmelevski (2A) all turned in multi-point efforts. 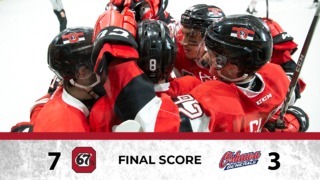 Cameron Tolnai, with his first OHL playoff game in his first playoff appearance, Noel Hoefenmayer, Mitch Hoelscher and Kody Clark also scored for Ottawa in the win. Mikey DiPietro made 25 saves to pick up his first-ever OHL playoff series win, while the 67’s fired 45 shots at Zachary Roy. For the second time in as many nights, 67’s fans packed the bar at Jack Astor’s Lansdowne to cheer on the team to another important victory. Ottawa hasn’t lost in regulation time since March 9. 67’s defenceman Nikita Okhotyuk, who had one assist in the game, was a game-high plus-4. Lucas Chiodo has a game-high nine shots on goal. Forward Kyle Maksimovich will be eligible to return to start the second round after serving the second of a two-game suspension on Wednesday. Cam Tolnai, Merrick Rippon and Marco Rossi all scored their first-ever OHL playoff goals. Tickets for Round 2 have gone on sale, you can get them by clicking here.